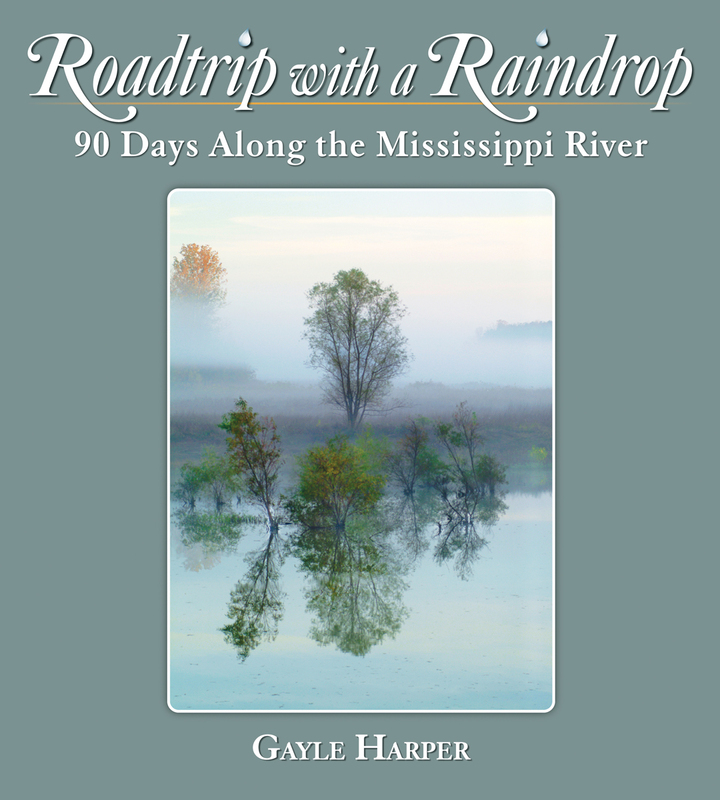 Roadtrip with a Raindrop: 90 Days Along the Mississippi River is a non-fiction travel book written by Gayle Harper. Harper is a travel writer and photographer who’s had a lifelong love of the Mississippi River. While she always had the inkling of a thought about a full-scale adventure on the river, it wasn’t until she saw a factoid on the National Park Service’s website that her thought bloomed to its full potential. The site said that a single drop of water falling at the headwaters of the Mississippi travels for 90 days to reach the Gulf of Mexico. Harper calculated that that drop would travel about 27 miles a day on its 3-month long journey; then she decided to call that drop ‘Serendipity’ and to travel along with it, and her project was born. I settled into an easy chair with a cup of tea and Gayle Harper’s non-fiction travelogue, Roadtrip with a Raindrop: 90 Days Along the Mississippi River, and found myself falling in love with the headwaters of the Mississippi and the marvelous natural settings of Minnesota. I had to keep reminding myself that it gets very cold there in the wintertime, and then I continued reading on, and studying one stunningly beautiful picture after another as Harper and her raindrop continued their journey south. There were so many places to see and stories to hear; all quite new for someone who’s only ever lived on a coast and barely seen the arch of St. Louis flash by on a road trip. 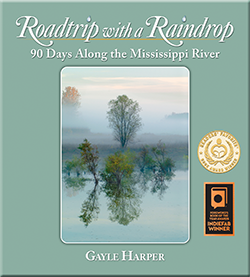 Roadtrip with a Raindrop: 90 Days Along the Mississippi River is an exceptionally good travel book that reads as smoothly as fiction and is filled with history, nature and the warmth and kindness of strangers soon to become friends. It’s a splendid read, and it’s most highly recommended.